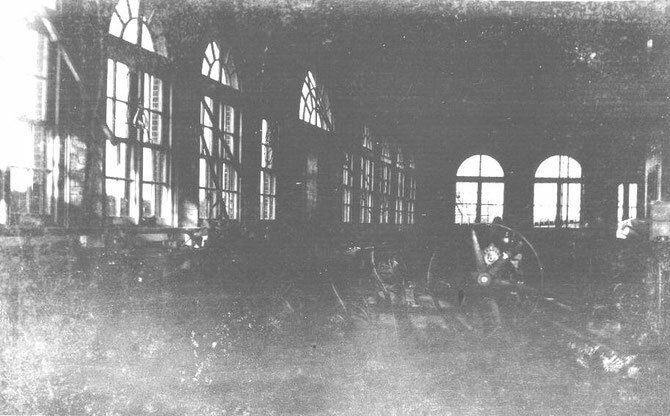 1 Westinhouse electric motor, used for power to drive machine shop, type C induction motor 6 H.P., nº 162319. 1 Milling machine with tools complete, made by Brown & Sharp company. 1 Lathe by Pond Machine Tool Company, nº P-3040, with tools, belting and shifting. 1 Westinhouse, type C, 2 H.P. Induction motor, nº 162278. 1 Westinhouse, type C, induction motor, 2 H.P. Serial nº 162272. 1 Westinhouse, type C, induction motor, 5 H.P. nº L-74487. 1 Westinhouse motor, about 1/4 H.P. nº 22190. 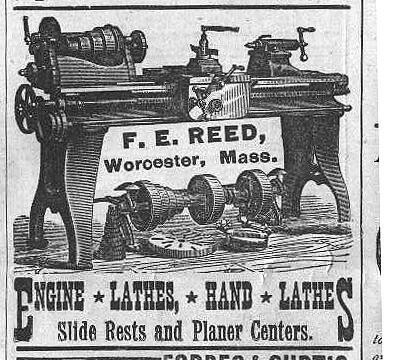 3 Lathes made by F.E Reed of Worcester, Mass, with shafting, belting and tools. 1 Plainer made by Hendey Machine Co., with shafting, belting and tools. 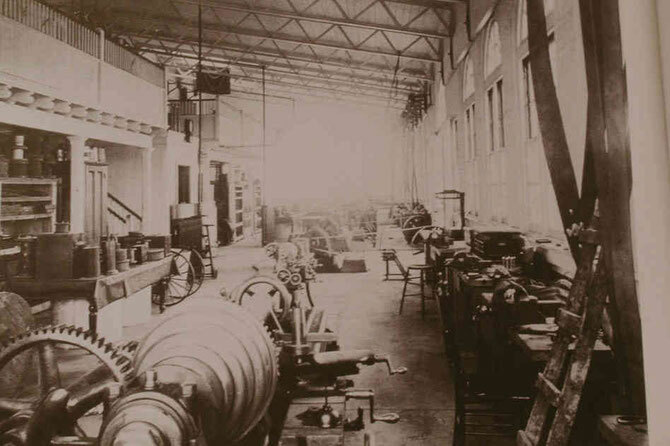 1 Plainer made by Pedrick & Ayr, with shafting, belting and tools. 1 F.E. Reed, hand drill press, shafting, beltinging and tools. 1 Large drill press by Prince Brothers, with shafting, belting and tools. 36 Lockers containing miscelanious supply for valves, joints, lubricators, fittings, scales, switches, single and double pole, socket, wrenches, fuses & plugs. A quality telephone and bell wire. A quality of lead cable material. 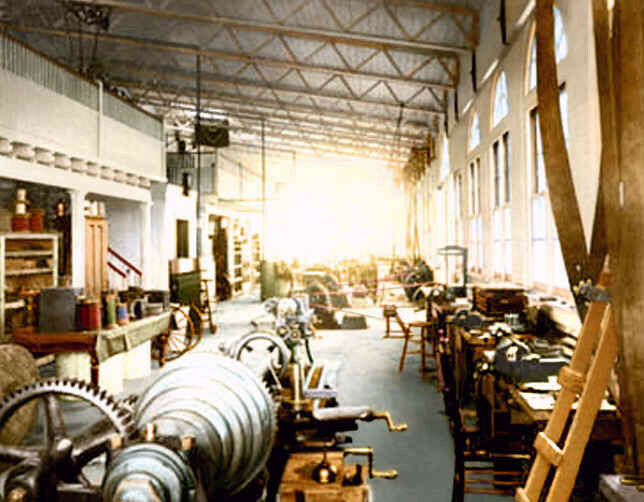 A quality of drills, rose bits, reamers, taps, and tools for milling machine and lathes, at present time in store room located in the workshop. 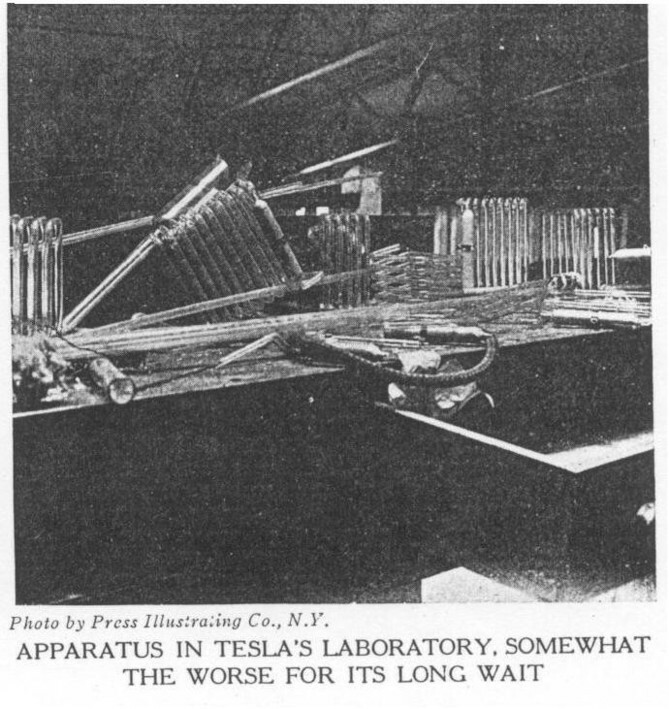 1 Testing motor by Crocker Wheeler, 1/2 H.P. with Rheostat, nº 1000. All of the aforesaid motors with starting boxes and switches. 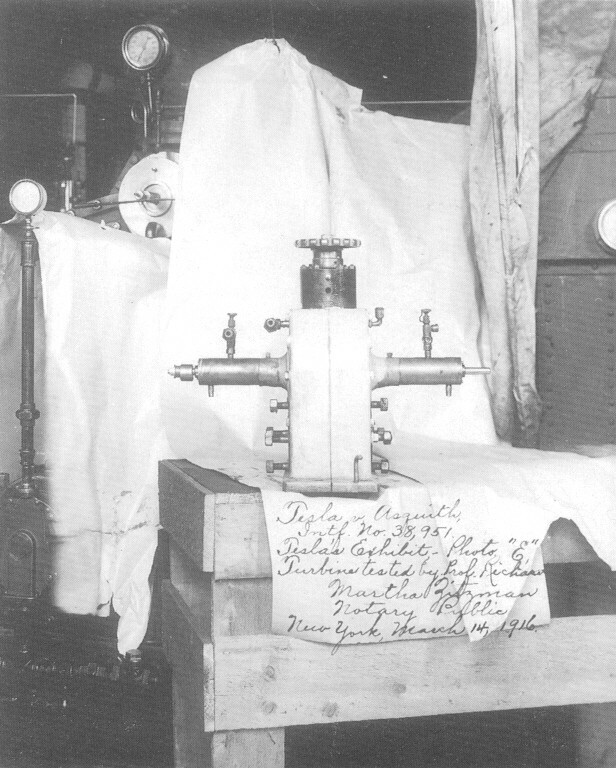 Tesla turbine at Wardenclyffe laboratory. 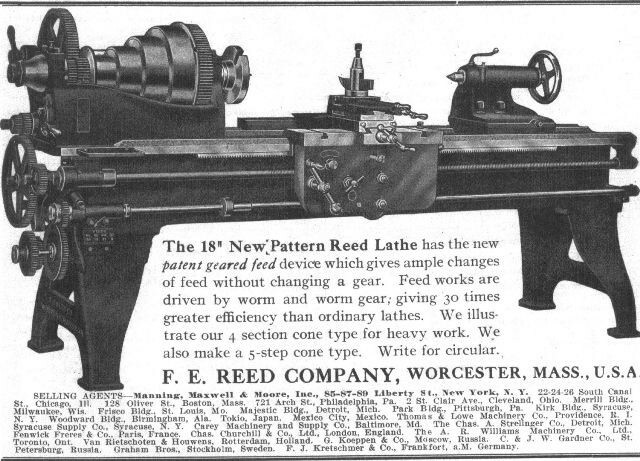 Exemple of 1900 F.E.Reed Prentice lathe. 16" stroke Powered Planer with automatic reverse, 1877 by Hendey Machine Co. The Richards Open-side Planer and Shaver — Fig. 4 shows a 36-in. 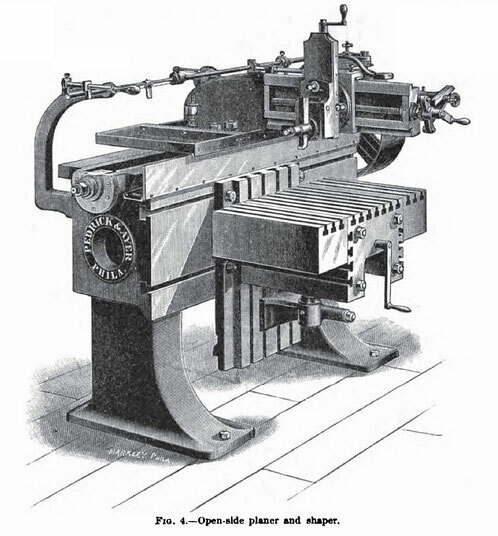 open-side planer and shaper built by Pedrick & Ayer, of Philadelphia. The construction and general arrangement of parts in this machine are somewhat different from the usual style of planers and shapers. The sliding head and cutting tool are supported by an overhanging or extended arm, moving parallel with the slotted side of bed, and the work to be planed remains stationary, being fastened to the plates or tables as may be required. The open side permits the planing of large and difficult pieces, and as they remain at rest while being planed, they are easier to set and fasten than they would be upon a moving table or platen. The saddle is moved by means of a screw and pulleys, with shifting belts, and has a quick return. For some classes of work, these open-side planers have advantages over the ordinary style of planer. Among them are the following: The tools move over the work, which is fixed. Large pieces and small ones are planed at the same speed. There are flat surfaces, horizontal, vertical, and parallel for mounting work, so pieces of any shape can be fastened at once. The shifting motion is such that the tools stop with the same accuracy as in a shaping machine. By removing the tables, work of any kind can be planed. Pieces of 10 tons weight have been planed on a 30-in. machine. The heaviest machines can be used for shaping, and run with a 2-in. stroke, without shock or jar. OPEN-BIDE PLANER ^ SHAPER. AND TESSRS. PEDRICK & AYER , engineers J VA <M3 A ma kers, of Hamilton and • ' ^itowood-streets, Philadelphia, are the makers of the 30 -inch open-side planer and shaper shown in the accompanying illustration. In several constructional details, this machine differs somewhat from others in the market. The sliding head and cutting tool are supported by an overhanging or extended arm, moving parallel with the slotted side of the bed, and the work to be planed remains stationary, being fastened to the plates or tables as may be required. The open side permits the planing of large and difficult pieces ; and, as they remain at rest whilst being planed, are easier to set and fasten than they would be upon a moving table or platen. The saddle is moved by means of a screw and pulleys, with shifting belts, has quick return, and is easily controlled by the operator. The advantages of this construction for general and heavy work.